Damn, I could not have said that better. 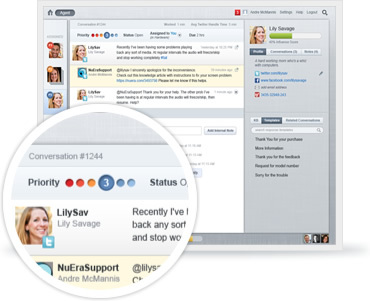 Being one of a relative few social customer service practitioners, who has built a high quality, scalable social customer support team, I have been perplexed over the past two years as to why customer support/service/retention/success has been the afterthought of the social media platform market. After all, doesn’t the terminology “customer engagement” imply there is life after they have been acquired? In my own humble opinion, most of engagement is post acquisition. Everyone knows customer retention is multiple times more cost effective than acquisition. And I do not believe Marketing will ever be able to scale efficiently to provide the intimacy social customer service requires. However, the social platform market is flooded with Marketing-centric products or “oh yeah, we need to cover social” CRM bolt-ons. This is why I was incredibly interested in a new company called Social Dynamx and their recently released purpose built social customer service platform. This cross functional knowledge also is provided at implementation. While it’s a cloud based product, each company should customize to teach your system what to look for. The last thing a customer service stakeholder wants to hear is sales people drown on about all the things it can do for you, when they have no idea how customer service or a call center works. 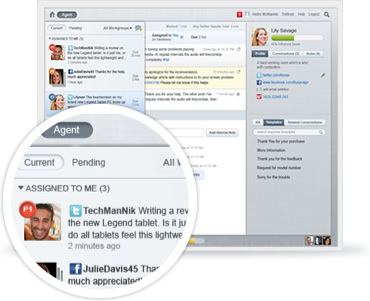 Social Dynamx background and experience provides both social and service understanding. In my presentation for Customer Service leaders, the 5 Steps to Set Up a Social Customer Service Team, the first step of the Customer Conversation is always Know Your Customer. 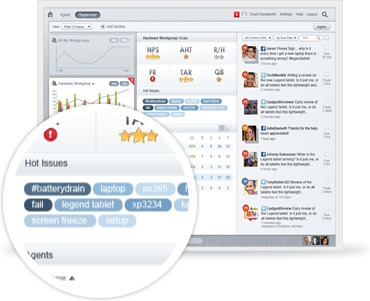 Social Dynamx provides a clean view of your customer’s major social networks,customer support/peer-to-peer forums and blogs, and an assessment of the priority based on their proprietary model scoring model. This priority should help your agents and management staffs understand the social impact a customer may have on your business. Of course, influence is contextual, and while someone may have a large following in technology, it may not pertain to your knitting business (for example). However, you never know how many of those tech folks like to throw a quilt together in their spare time. For future versions, I would love to see a more integrated view of YOUR customer’s value or customer lifetime value. You need to understand both social impact and the specific value this customer represents to your company. The conversation thread feature is perfect and rarely seen in anything on the market today. How can I measure my agents? Yes, there are out of the box metrics for measuring SLA’s (service level agreements) and customizable fields. We discussed the future need for management to be able to quality monitor their associates, and is a critical aspect towards agent measurement. There is, however, a nice connection to your knowledge base to more quickly answer questions. I probably not buying a whole new CRM (especially in this economy), does this work with my existing account or issue management tool? It’s cloud based, so no servers to maintain on site, and is an open architecture to integrate with major CRM tools. Obviously, considering this was a demo, I was not able to witness how their systems integrate with CRM platforms. This is a perfect opportunity to bring in your network support team to understand the implications. As a Customer Service leader, I am thrilled to see a company think “customer support” first, and I believe Social Dynamx has developed the solid, very customer centric social customer platform. I love their approach, starting with understanding the customer through implementation. Considering this is a newly released public product, they have a high majority of the critical business requirements covered. (Product has been in place in a number of enterprise organizations, however, it has not been available to the general service public.) I believe the biggest challenge will be the businesses they work with, as there is still a huge, glass barrier of customer service leaders actually taking hold of the customer service reigns, and driving their social business. You can learn more about Social Dynamx here. *I am not associated with Social Dynamx in any material manner other than my friend relationship with Heather Strout, and received no compensation for providing a review. All commentary contained within is strictly my own perception and thoughts. So if you are a hater, you know what you can do.